Here are a few new buys and some refills I picked up in the beauty department over the weekend. Refills: Gaiety blush and Vanilla concealer. Gaiety is a gorgeous peony pink blush that is subtle and feminine. I use the concealer under my eyes and for any areas of my face that I want to highlight when I’m contouring. New Buys: this gorgeous eyeshadow pallette (I love the soft pinks and deeper purple tones) and a new neutral pink lip combo that you can see me wearing in yesterday’s post. Spring time means warmer temps and bare legs! I picked up this LaMer Gradual Tanning Lotion so my legs don’t look so white in all my dress and skirts. I’ll let you know how I like after I use it for awhile but so far so good! Ok I know this isn’t a beauty item but these earrings have been a staple in my accessory drawer since I was in high school. 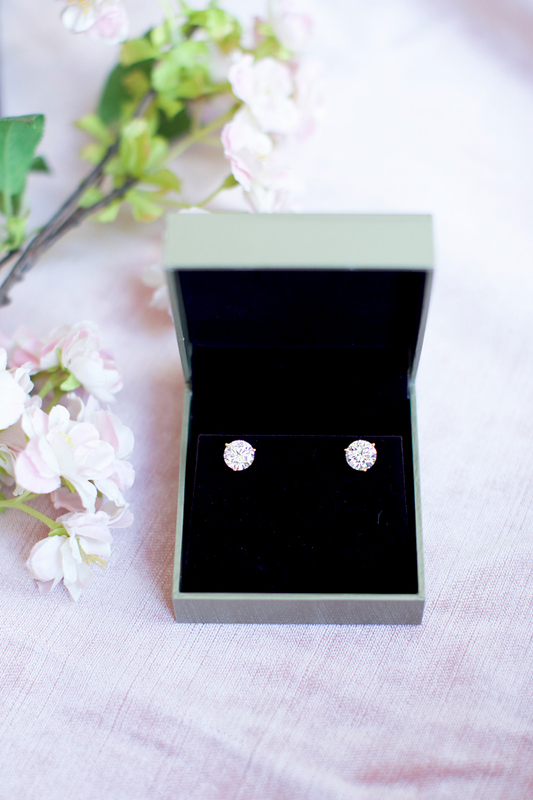 There’s nothing I love more than simple and classy diamond stud earrings. Through the years, I have lost at least a dozen pairs so I’ve found myself replacing them every so often but they’re worth it!!! I absolutely love living in Utah but for some reason I really struggle during January and February (and apparently March). Utah is one of the most beautiful places in the world (9 months out of 12) but during these three months it SO dreary. Old dirty snow everywhere, the inversion hits, it’s really just grey outside, all the plants are dead, and on top of that it’s freezing outside. This might sound crazy but I swear I get a little down during these months (has this ever happened to any of you??) and this year has been the worst because Isla and I have both been so sick and because of the inversion that creates poor air quality so we’ve been cooped up in the house with no sunshine. Over the weekend the sun FINALLY came out and it was warm (in the high 60’s, yay). Getting a glimpse into spring gave me a little pep in my step and made me want to get out of the house and pick up some fresh new beauty items for the new season! I also picked up this dress I wore yesterday along with this one too! Cute options for Easter Sunday!! Good to hear the weather finally changing! I would be the same way too and get inspired to buy new things for the season! Love your new beauty buys! I experienced the “winter blues” in college around this time of year – it’s the same type of weather in Iowa, very dreary and still freezing cold. Taking Vitamin D supplements helps and just being around friends and family seems to lift me up :) Hope it gets better for you! All of these products look amazing! I also definitely know what you mean about the weather. When I am studying day-in, day-out in the library and it’s freezing, dark, and grey outside, I definitely feel myself getting in a rut. The colors on the eyeshadow palette look really versatile for various occasions, love it! Pretty earrings too, simple for so elegant! Chicago is gross January-March, too. Just blahhh!! But we’ve had some spring teaser days, too and I cannot wait for the weather to warm up again!! You are totally not crazy to feel down during these months – you may have a mild form of Seasonal Affective Disorder, which is basically a depression caused by the weather/seasons. You can Google it, it’s a real thing! I have it too but everything gets better once the sun comes back out! Hope you and Isla are on the mend for the rest of the season! I need to try the lip color snob! Great buys. Glad you’re feeling better. Love that eyeshadow palette! Such nice colors for spring. So nice to see your beautiful posts again. Thanks for your honestly about the winter blues. I live in the northeast and this happens to me as well. To ease things my family doc recommended a 10,000 LUX light which you can buy online or in a medical pharmacy. It replaces the good light that is lacking this time of year, and lets you absorb it without any harmful effects you won’t get a tan or a sunburn or be exposed to harmful UV’s. There are many different types my experience is to go for the expensive ones. they’re bigger and better quality. You just need to sit with it for 20 minutes at a morning usually when you are first up and get settled you can even catch up on some emails and have it aiming at a certain angle that it will tell you about in the instruction and voilà it really helps . I haven’t had the winter blues badly at all since I’ve had this late it’s scientifically proven in medical journals to work it’s not a fad or anything like that it’s medically proven. The trick is to consistently sit near the light 20 minutes per day every day. It’s gives off the same light as a reading light. But it’s the good stuff your body is missing. I would love to see you do some kind of go-to everyday makeup look. I always love your beauty style, so it’s fun to see your latest picks! I used to live in a snowy place and it was the same way! Every year everyone would get really down during the winter months because it’s so grey out. Hang in there, it’s normal. This post is beautiful! Great picks and I love the earrings! I know exactly how you feel. February was brutal for me this year. Sick with colds, grey skys, feeling cold all the time. This past weekend I feel like I broke free. I live in utah too and I for sure get the winter blues! I am happy to hear things are lightening up for you though! 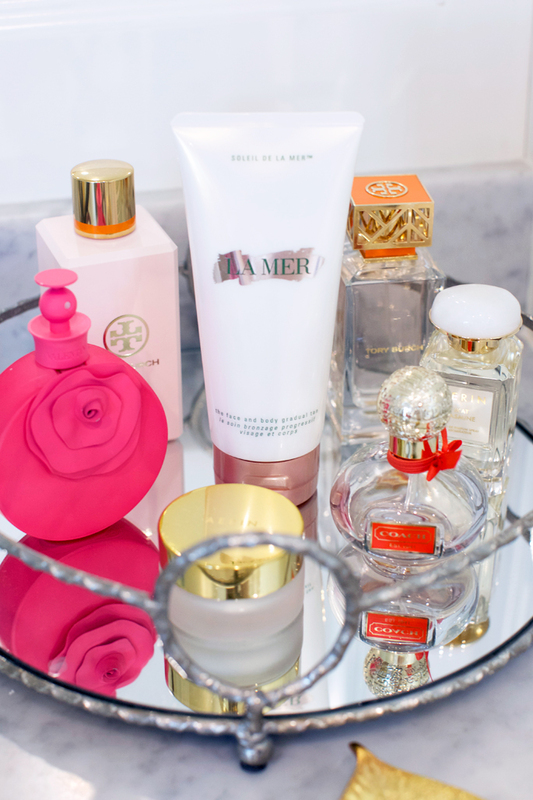 I’m curious to see how you like the La Mer tanning lotion. And yes, dreary weather has affected my mood, too. Hope you feel better soon! Love the earrings!!! So gorgeous!!! I live in the midwest where the winter months are just as you described. This year I got one of the seasonal affective disorder therapy lights and it literally changed my life. I don’t have a diagnosis of SAD but I feel all of us benefit from light and sunshine. I got the curex Day Light on amazon and it is the best thing I ever did. 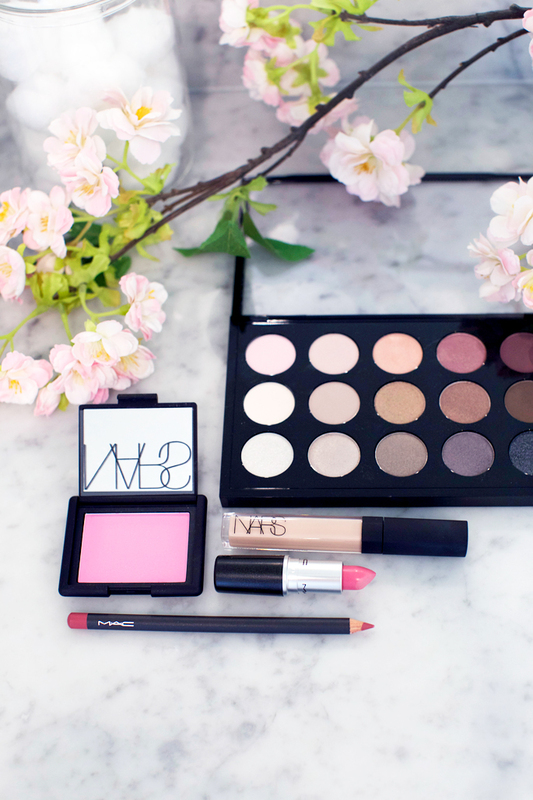 Love that Nars palette, it has all the colors you need! Love the NARS concealer, I use it everyday and it’s amazing! I seriously love it and totally recommend it! I get sad in the winter, too! I’m so glad you had nice weather this weekend to help you feel a little better! Those earrings are beautiful!! Need to add them to my wish list! loved this post! would love to see more like this! thanks for sharing! Those eyeshadow colours look gorgeous! I’ve never used La Mer but would love to try! Love the pink lipstick- pink my always my favorite! I love this glimpse into spring as well. Love that color palette of the makeup too! I love this post! I totally agree with you about the cold and dreary weather. I grew up in California and got the winter blues every year november until about march. Its it not only bone chilling freezing and the dirty snow but it is ALWAYS dark. The darkness is the very worst. I live in California now and never feel that winter slump. It sounds like you need some good vitamin D and a sunny vacation! I love those earrings I just ordered them! The Nars blush shade is gorgeous! In Spring i definitely love my Urban Decay Concealer and a pale pink blush! The Nars blush shade is gorgeous! In Spring i love my Urban Decay Concealer and a pale pink blush. I’m in Utah as well! I totally feel you. The early months are the hardest. Especially on my white, dry skin! Ugh. 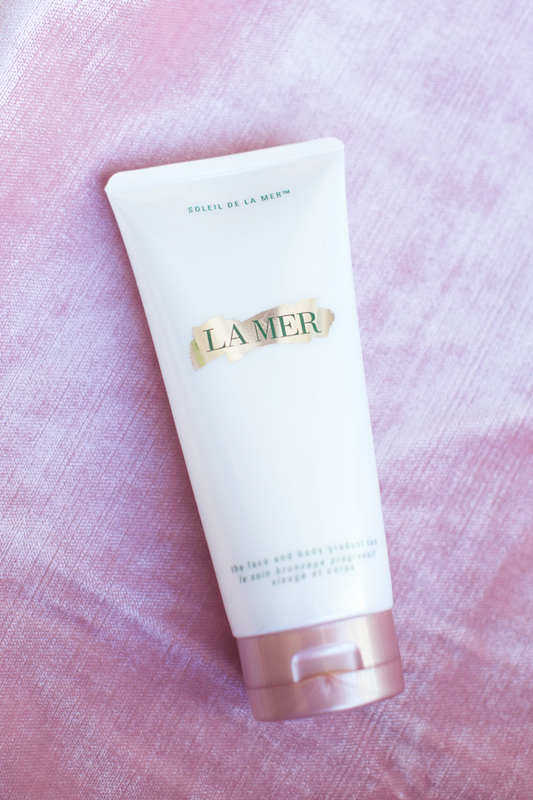 I’m excited to see your review on La Mer! I’ve heard good things! Great post, love the items you got, hope you start feeling a bit brighter soon! You got lovely spring bits! I love the Nars blusher, the colour is absolutely stunning. The earrings are beautiful as well, I’m looking for a classic pair of studs like that so this is exactly what I need! What was your favorite spring look this year?